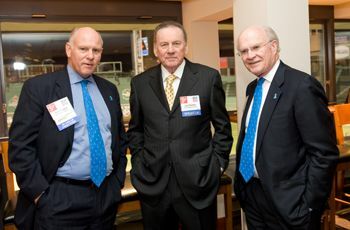 Allen L. Snyder III is very involved in the Massachusetts Prostate Cancer Coalition (MPCC). Snyder is a founding member, and a current board member for the organization. The MPCC is a non-profit organization that provides education and information on prostate cancer to patients and their families, survivors and healthcare providers. In collaboration with local hospitals and healthcare providers, they sponsor prostate cancer research, along with raising money for further prostate cancer education and research. Pictured: Al Snyder chats with Len Dawson, former Superbowl quarterback of the Kansas City Chiefs and prostate cancer survivor, at the 10th Annual Conquer and Cure Dinner. Please join the MPCC on October 28th, 2009 for their 11th Annual Conquer and Cure Dinner which will be held at the Royal Sonesta. Choir member since 2007 in Boston's historic North End. As an Ohio Wesleyan University Alumnus, Allen Snyder is actively involved in fundraising for his class. He was also a member of the Alumni Board from 1985-1990, and he was the chair for his 25th Reunion.